We’re entering into new territory in the life of our homeschool: organized sports. If you have younger children you might truly be wondering what your athletic child will do when the days of Little League, Upward, and various other rec league opportunities come to an end. Sports opportunities are abundant when kids are little, but what happens when they get to the middle and high school years? Quite a few parents have told me they have decided to send their child to traditional high school for the sports opportunities (among other reasons). I believe this is fear talking - or perhaps sports sound like a good enough reason to stop homeschooling your high schooler. As the mom of an extremely athletic boy, I understand the importance of sports. They provide a much needed physical outlet, a vehicle for a competitive nature, and an opportunity to challenge personal limits. Then that homeschool mom mindset kicks in. You know what I mean. We tend to be skeptical of “group” anything. We also tend to hold our children’s activities quite closely. We’ve done a lot on our own thus far, right? As you seek the best sports situation for your child, be sure it aligns with your homeschool vision. What are your ULTIMATE goals for your homeschool graduate? Will these athletics support those goals? Have you prayed with and for your child about their education? About their athletic opportunities? Sometimes FEAR begins to kick in as our children approach the high school years. Don’t ever forget we must have faith - not fear. First, we need to understand the facts - more specifically the facts for the area where we live. I imagine that, if you live in one of these states, weighing the pros and cons of participating in a public school sports team is important. If you homeschool for religious reasons, be prepared for God to be off limits now. You should also understand the INTENSE peer pressure that exists in public high schools today. Some of the statistics surrounding sexuality in public high schools are astounding. Then again, you may know the exact situation your homeschooler would be stepping into - and if you keep close tabs on the situation all could be well. In my area (Atlanta metro) there are an abundance of these schools. These schools give homeschoolers a chance to play on their sports teams, sometimes regardless of their enrollment status. This option is one we have become acutely familiar with in the past year. Many private schools (especially smaller schools who might need players for teams or who are trying to increase their revenue) welcome homeschoolers on their sports teams. My son has been playing basketball for a local Christian school this season (in fact, they just won the state championships - how awesome is that?). The benefits have been TREMENDOUS, and we have loved the emphasis on Godly character and sportsmanship. Sometimes all it takes is putting out feelers to see if there are schools in your area that allow homeschoolers to play - and it never hurts to make a call to a school to ask about their policy. And here’s an interesting side note - we actually had a choice of where my son would play basketball this year - a local hybrid school or a Christian school just down the street from us. Homeschool parents are resourceful when there is a need for their children. We have played on a tennis team that was organized by homeschool moms. They secured two tennis instructors and lessons were offered each Friday morning. Children who were interested could play on a USTA team (easily organized by a parent). I can imagine the sky would be the limit with the sports opportunities you could create - if you know children who are interested and someone who is willing to lead/instruct the group, you are set. Finally, we have used our local YMCA for many years. Our branch offers basketball, tennis, swimming, baseball - and probably so much more that I am not even aware of. Granted, these opportunities tend to diminish once children are in 9th grade. My children also use the YMCA for simply working out, too. Our membership has been of such value during our homeschooling years. At one point my kids even took a Homeschool PE class at our local YMCA. I hope you are reassured about the ABUNDANCE of opportunities for athletics in the upper years of homeschooling. I’m in the middle of it all now, and will keep you posted as life for my sports loving boy continues! Do you have an older child in organized sports? Leave me a comment below and let’s share situations! 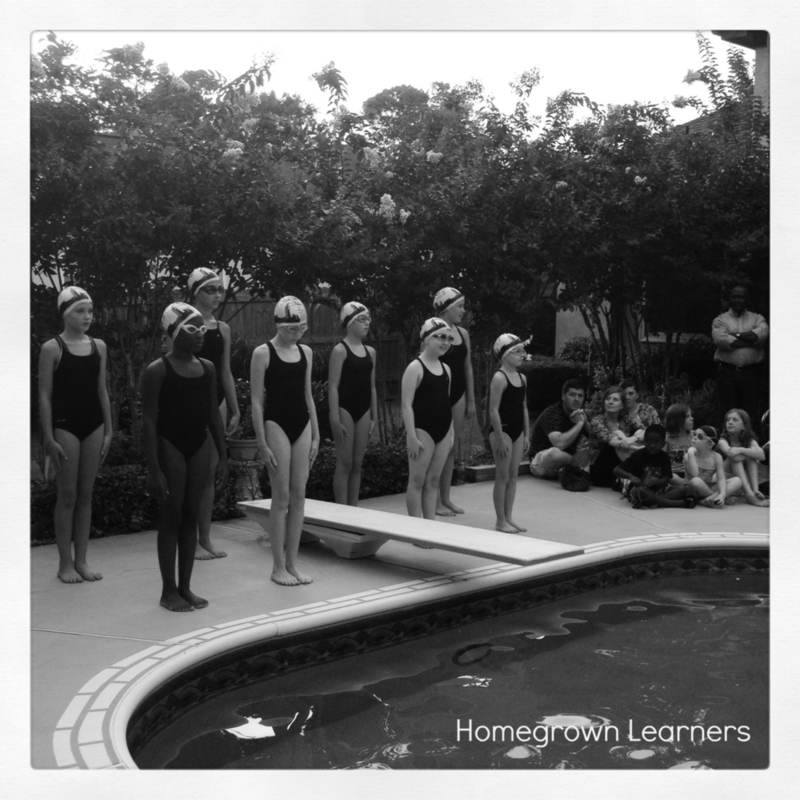 Each summer for the past four years my children have participated in a summer swim program. We are blessed with a swim teacher that loves each and every one of her students. It is a supportive, caring environment and my children look forward to the summers because it means they get to spend time with Miss Betsie.